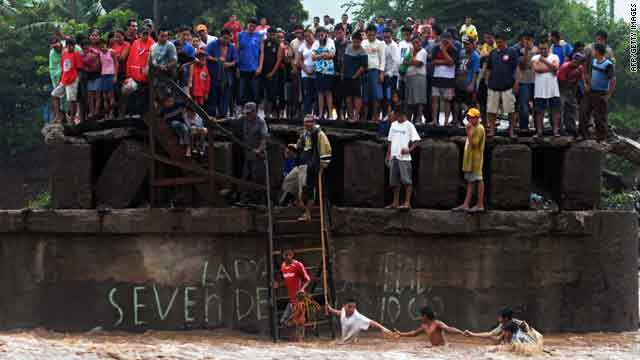 People try to cross the overflowed Huiza River, as others look from a damaged bridge in La Libertad, El Salvador. (CNN) -- Tropical Depression Agatha unleashed torrential rains over Guatemala, southeast Mexico and much of El Salvador, triggering flash floods and mudslides. Downgraded from a tropical storm -- the first of the Pacific season -- Saturday night, Agatha left at least 12 people dead and another 11 missing in Guatemala, the UK Press Association reported, citing National Disaster Relief Coordinator spokesman David de Leon. Four children were buried in a landslide outside Guatemala City, and four adults were killed in the capital itself, de Leon said. Another two children and two adults were killed when a boulder, dislodged by heavy rains, crushed a house in the department of Quetzaltenango, 125 miles (200 km) west of Guatemala City, de Leon said earlier. The system was expected to bring 10-20 inches (25-51 cm) of rain over the three countries, with possible 30 inches (76.2 cm) in some parts through Sunday. Guatemala is already under a 15-day state of calamity because of the eruption on Thursday of the Pacaya volcano, which killed at least three people. At least 1,800 people were already evacuated to shelters, de Leon said earlier. The volcano had shut down the capital's international airport. Is the eruption affecting you? As of 9 p.m. (11 p.m. ET) Saturday local time, the storm was 25 miles (45 kilometers) east of Tapachula, Mexico, with maximum sustained winds of 35 mph (55 kph), according to the U.S. National Hurricane Center in Miami, Florida. All tropical storm warnings have been discontinued, the center said. The storm was moving northeast about 5 mph (7 kph) and was forecast to weaken as it moved farther inland over high terrain in Central America, the center said. Tropical storm winds extended outward up to 80 miles (130 km) primarily over water to the southeast of the center, the center added.